Join Sue Donaldson, Wen-Shwu Lee, Cathy Wilder, and Vicky Frederiksen at the Pegasus Office to experience the essence of the Haven‘s Program and bring home some tools on how to transform addiction through integrating the 12 steps with Haven concepts. Cost is by donation. Space is limited – Register today! 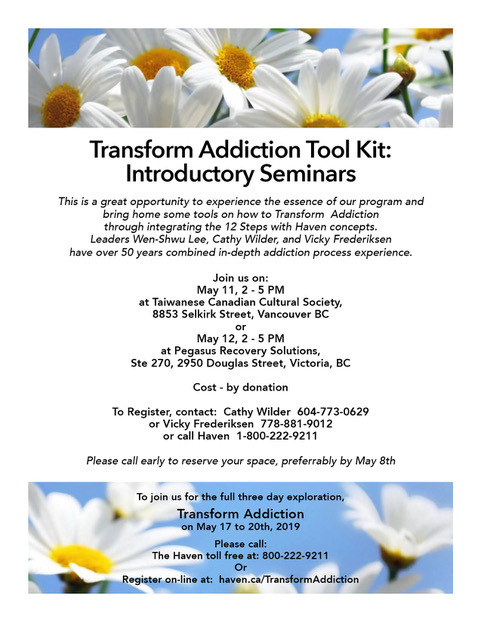 This Transform Addiction Toolkit Session is an introduction to the full Transforming Addiction: Widening Your Path in Recovery Program provided at the Haven on Gabriola Island. This program gives participants an expanded perspective and increased choice in recovery from various addictive behaviours, by integrating 12-step and Haven models. We believe addiction is far more complicated than this. In this program we integrate several elements, including 12-step and Haven models, to provide an expanded perspective and different choices in recovery from various addictive behaviours. Note This program is not designed as clinical treatment, and is not for people who are still actively using drugs or alcohol. To register for the Transform Addiction Toolkit being held at Pegasus Recovery Solutions at 270-2950 Douglas St. or for more information please call 1-800-222-9211.